Stock status is current as of 4/24/2019 10:50 AMET. The 3.5mm stereo to RCA stereo audio cable is specifically designed to provide quality music transfer. 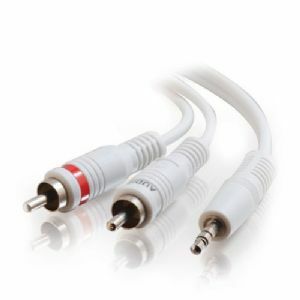 With this cable you can connect a PC sound card, portable CD player, MP3 player, iPod, or any mini-stereo audio device with 3.5mm jacks to other audio devices with RCA audio jacks. This cable features two 26 AWG oxygen-free copper conductors, a drain wire, and an aluminum foil shield to reject noise and prevent unwanted EMI/RFI interference. Nickel-plated, fully molded connectors provide strain relief and ensure a quality connection.